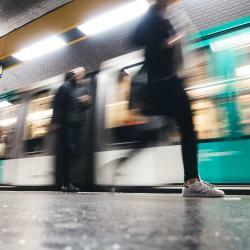 Looking for hotels near Villejuif-Léo Lagrange Metro Station? Set in a renovated farmhouse in Villejuif, La Ferme Des Barmonts offers self-catering accommodations with free WiFi. It is 0.6 mi away from Porte d’Italie in Paris. This 4-star hotel is located a 7-minute walk from La Place RER B Train Station, which provides direct access to central Paris as well as Charles de Gaulle and Orly Airports. The bed was Amazing. The breakfast was excellent. With free Wi-Fi and air-conditioned rooms with a spa bath or shower, Green hotels Confort Paris 13 is an ideal choice for your stay in Paris. It is a 5-minute walk from Olympiades Metro Station. Location only about 500m walking distance from Metro/RER train station. Set in the 13th district in Paris, Lodge In provides accommodations with free WiFi throughout the property, only 1.2 mi from the National Library of France and 1.6 mi from AccorHotels Arena. Very goog location 5 min walk to porte d'ivry metro station pink line. Located at 3.1 mi from Parc des Expositions Porte de Versailles, ibis Paris Porte d’Italie offers a French restaurant, a bar and air-conditioned, rooms with attached bathroom. Everything clean , professional and good breakfast . Hotels with great access to Villejuif-Léo Lagrange Metro Station! Located in the Butte-aux-Cailles quarter of Paris, just 0.6 mi from Parc Montsouris, this hotel offers air-conditioned rooms and a bar with a terrace. Very helpful staff, great location. Mercure Paris Place d'Italie is just a 2-minute walk from the trendy village of Buttes-aux-Cailles and the Chinatown. It features air-conditioned guest rooms with free Wi-Fi access and satellite TV. Staff are nice. Alesia at the reception was very helpful. Room was compact but ok. Located just 164 feet from the lively Place d’Italie in the South of Paris, ibis Paris Avenue d'Italie hotel offers modern accommodations. Very good support from the staffs of the hotel. Comfort Hotel Cachan is located 6.2 mi from Orly Airport and 1.2 mi from Maison des Examens. It features rooms with a contemporary décor, a free private parking and seminar rooms. all staff were kind. thanks for keeping suitcase after check out until evening. Best Western Amiral Hotel is located just a 1-minute walk from Tolbiac Metro Station, providing direct access to the Louver Museum. It offers an indoor heated swimming pool. We chose the property because of the parking. We loved the location.